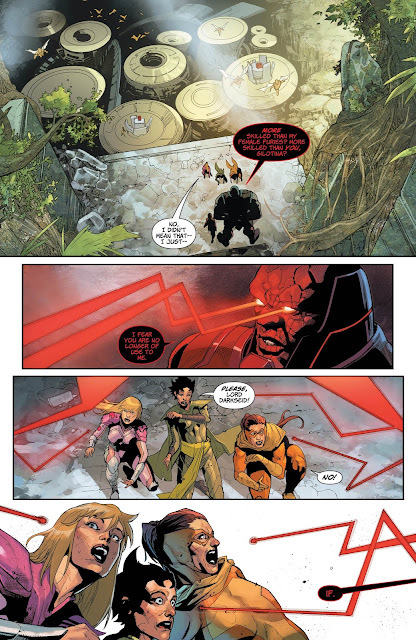 In our previous issue we saw Jason taken by some form of purple energy and while I don't know what that energy was, I know we're dealing with Darkseid and Grail so at this point I have to assume that one has to do with the other.......... but we all know what happens when you assume....... so..... let's just leave it at that. Let's jump into this issue and see what Darkseid has planned and if Wonder Woman will ever get her brother back. Let's check it out. Our issue begins with Darkseid very displeased that the Female Furies were defeated by Steve Trevor and the Odd Fellows and that they weren't able to collect the relic they were sent for. 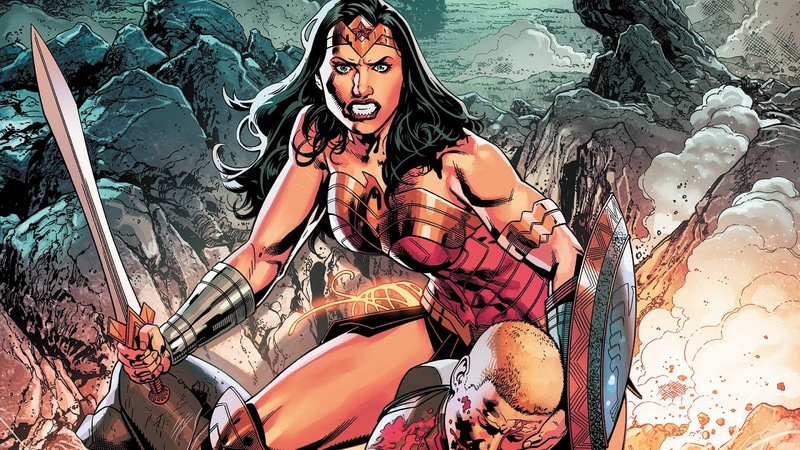 Really though, through all of this, we only really find out that Darkseid is pissed because Earth means nothing to him now that Themyscira is gone from this world.......... Which is odd, because it should have always been gone from what we got out of Rebirth. 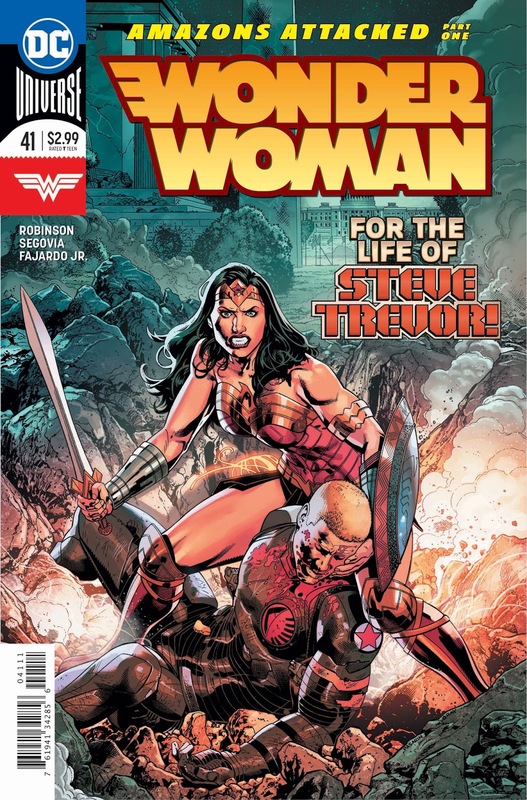 Once we leave Darkseid, we go to Diana and Steve Trevor, who are telling each other about their day, while having really forced recap about what's gone down in the last bunch of issues........ and it's just really....... just not good. 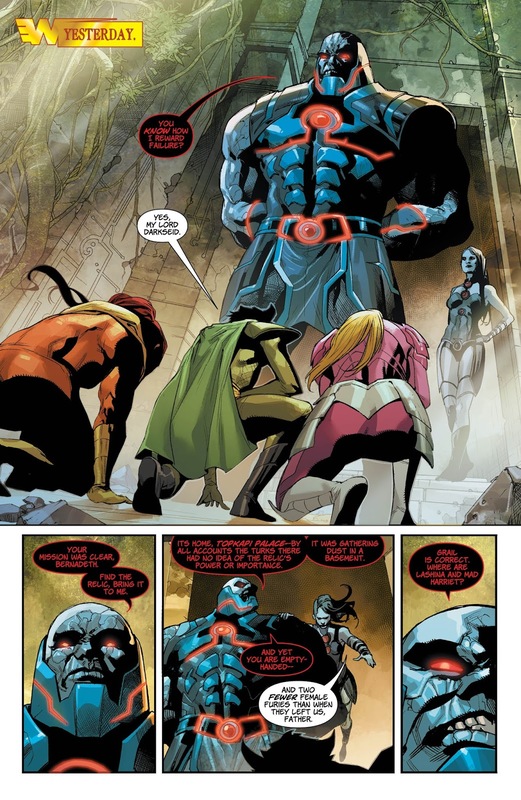 Ultimately, from all of this we discover that Veronica Cale still has a grudge against our hero and that ARGUS is making sure that they're collecting all the Apokoliptean artifacts that they can get so that they're kept safe from Darkseid. The worst part about all of this though, the most interesting parts of this story are told in an aside with only a couple of panels showing what happened, while what we get to see instead is Steve Trevor and Diana talking in an airplane hanger. In the end, Jason shows back up sporting some pretty cool armor............ and that's about it. That's it for this issue of Wonder Woman and where I was originally really excited for James Robinson jumping on this book........ Everything we've gotten from him has just been bad to mediocre and I don't understand how this could happen. This title has become a chore to read because it just isn't that interesting and things never play out in a straight forward or exciting way. The whole series has turned into standing around and talking, while occasionally fighting a bad guy, who is defeated way too easily, while waiting way too long to get to the story that's going on in the background that we all showed up to see. The art continues to be really good, but I just need more out of this title at this point because it's been too long since we've had anything solid out of it. The dialog in this issue felt seriously forced, everything that was interesting about this issue was told in an aside and we were left with an issue that was pretty much two people just standing around. Very disappointing. 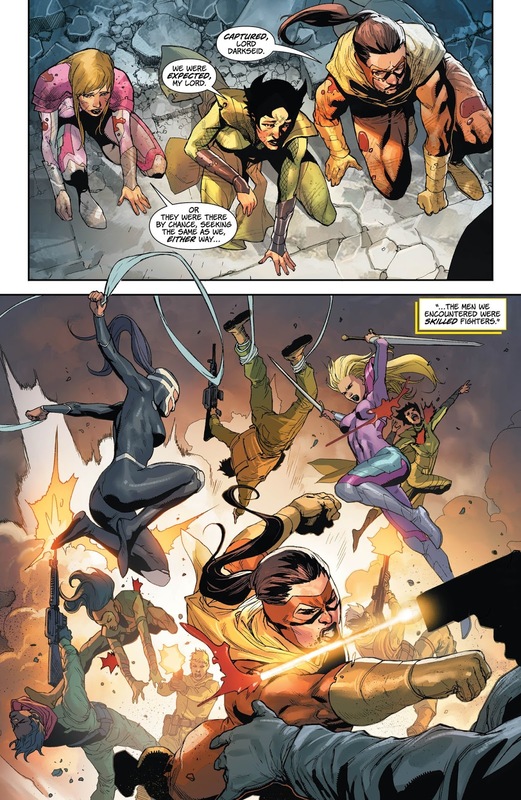 While I was still holding out for this title to make a comeback and start "Wow-ing" me again, this issue just really proves in my mind that that will never happen. For every issue where something important seems to happens, we get three more that just seem like filler and recap and sadly, this is one of those issues that really does nothing with it's page count. It's not a review, it's clickbait when people see an absurd score on comicbookroundup and therefore you get traffic for your site. Having your own opinion is fine. But a 4/10 should be unreadable, close to offensive. Your review pretty much says "this is a decent but not original story" all the words imply a 6-7/10ish rating, lower than normal but a fair and honest review. Then you slap on a 4 instead and wait for the clicks to flow in. Well, I can't say i'm the greatest fan of this blog, but I agree with the author-- this run is being horrible. And for me it's a little depressive because I love James Robinson, I think he can write women very well, and I whish him the best. Funny, i feel the same way about the La Xanocueva blog! And Eric will certainly take your backhanded compliment...he craves them!